If you’ve just purchased the new iPhone 5S then you might want to keep it looking as great as it does now. A case is the best option and plenty of people live lifestyles that demand extreme protection for their smartphones. Today we have details of the Spigen Tough Armor iPhone 5S case, and we’ve also got an independent video review of it for you to look at. Make no bones about it this is a case that looks good and will also give decent protection for your iPhone 5S or iPhone 5. This Spigen Tough Armor case provides impact absorption with new air cushion technology and the spider web pattern on the interior provides better air circulation than some case designs that feature foam-like interiors. It’s made of premium polycarbonate and anti-stretch TPU, features tapered edges and comes in matching colors for the iPhone 5S. It’s slimmer than many other protective cases adding less than 4mm thickness to your iPhone. The Tough Armor case for iPhone 5S and iPhone 5 also features a tapered lip that protects the iPhone screen from direct contact with surfaces. The short YouTube video below is a review of the Spigen Tough Armor case for the iPhone 5S and shows the champagne gold color option. It details nice touches such as the cutout for the Apple logo on the reverse and also shows how easy it is to fit, and there’s a lot of positivity for the case in this review. The Spigen Tough Armor case for the iPhone 5S/5 is priced at $29.99 for the champagne gold version, which will be in stock at Amazon from October 24, so just a few more days. It comes in several other color options, Metal Slate, Satin Silver, Smooth White, or Soul Black and these are already in stock at various prices (see link above). In our previous best iPhone 5S cases article we also detailed the Spigen Slim Armor Case so you might want to check that out here. 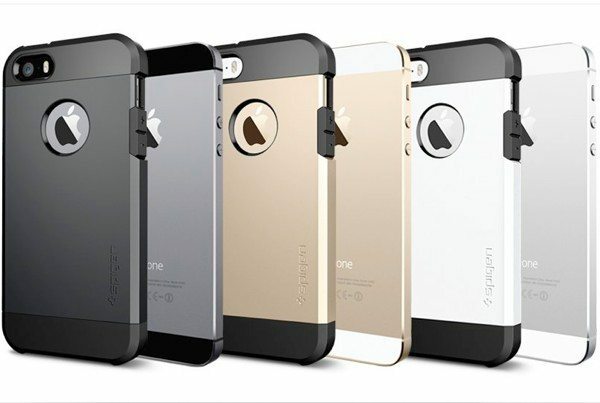 What are your thoughts on the iPhone 5S/5 Tough Armor case from Spigen?